Add new AccountRepresentative protocol, to which Account, TreeNode and PlaceholderNode conform. Provides base Account metadata – accountId, name, type, and is accepted in many places where Account was formerly required. Rejoice, Pythonistas! A new version of the Amatino Python library is now available. 0.0.13 adds new capabilities. Amatino Python is now nearing initial feature completion, with almost all existing API classes covered. Watch out, 0.0.13 is catastrophically breaking, many method signatures have changed and code written for 0.0.12 will not work. Why all the breaks? Many methods in 0.0.12 required the provision of a Session independent of an Entity, despite that Entity having ready access to the Session used when it was itself initialised. This redundancy was needlessly verbose. Ledger and Transaction may be now be directly iterated over, revealing constituent LedgerRows and Entries respectively. They may also be subscripted. The new UserList allows you to retrieve all white-labels managed by your billing account. 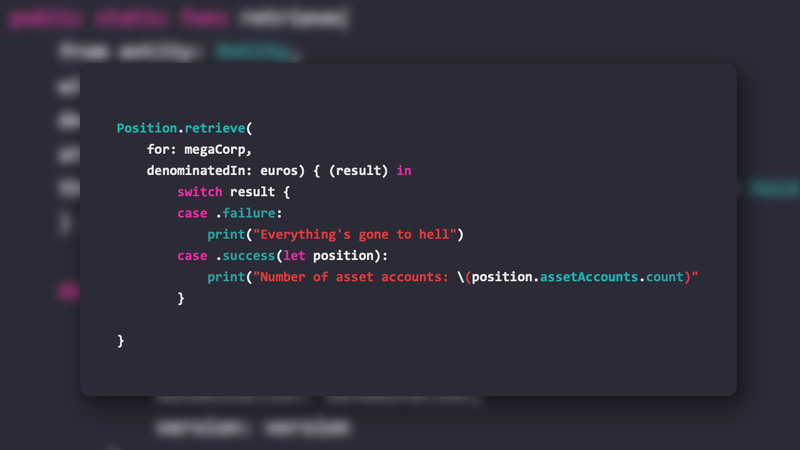 Draw on the State enum to refine the retrieval to all, deleted, or active users. Review the history of modifications to a Transaction using the TransactionVersionList. For detailed documentation of the properties and methods of all Amatino classes, check out the Amatino Python Documentation. Your feedback is most welcome on the Amatino discussion forums, or on Twitter. Hot on the heels of 0.0.11, Amatino Python 0.0.12 has been released. 0.0.12 enhances the capabilities of the Position and Performance classes added in 0.0.11, and introduces the new Tree class. The new properties in Position and Performance give you quick access to key financial data describing an entity. Check out the Amatino Python documentation to see all the new properties. 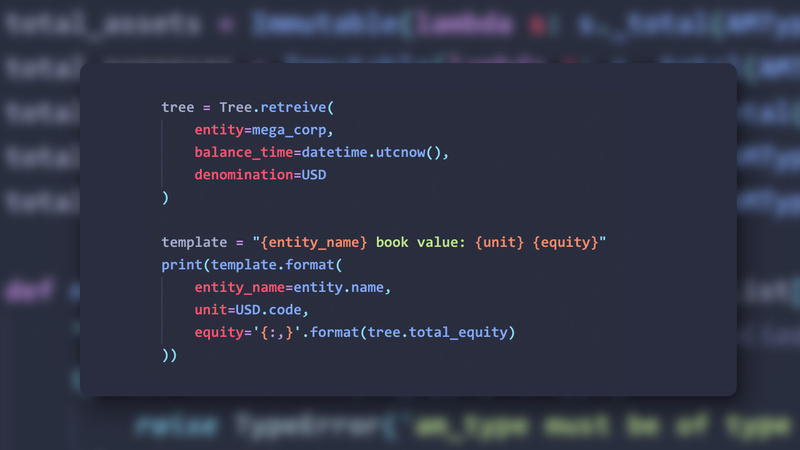 The new Tree class is a beast, combining all accounts in an entity into a single recursive object, at a particular balance date. Like Position and Performance, Tree accounts are of type TreeNode, which means you have access to recursive and individual balances and other useful data. For detailed documentation of the properties and methods of the Tree class, check out the Amatino Python Documentation. Be sure to leave your feedback on the Amatino discussion forums, or on Twitter, we’d love to hear what you think about Amatino Python. Account objects now feature a ‘Children’ parameter, which contains integer IDs of all direct child Accounts. A tiny update has been released for Amatino’s Node library. 0.0.14 fixes a silly bug in the inbuilt Node version enforcement script. The script is run after installation, and was supposed to stop Node versions lower than 10.4 from running Amatino JS. Instead it was stopping versions greater than 11.0 from running it! Amatino JS 0.0.14 is available on NPM and on GitHub. Internally, the Amatino API only thinks in 64-bit integers and arbitrary-precision numbers. Floats & lower-width integers are absent. These 64-bit integers flow out into the public domain as IDs of various objects. For example, Session IDs and User IDs are random 64-bit integers. 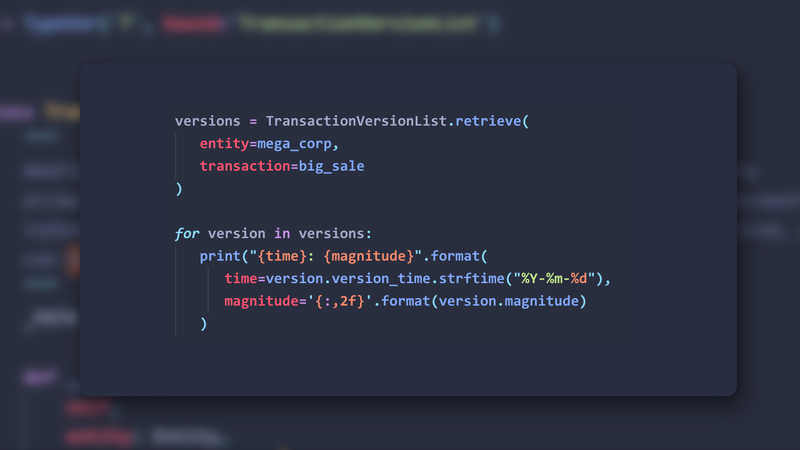 If your Entity is extremely large, you might also encounter them as IDs for Transactions. Surprise surprise, this caused problems for customers. We are very sorry for that. 0.0.13 solves the problem by taking advantage of the “new” native BigInt type. BigInts arrived in Google V8 version 6.7, have been available in Node since version 10.4. Consequently, Node.js 10.4 is now the minimum required version for a project that includes Amatino JS. 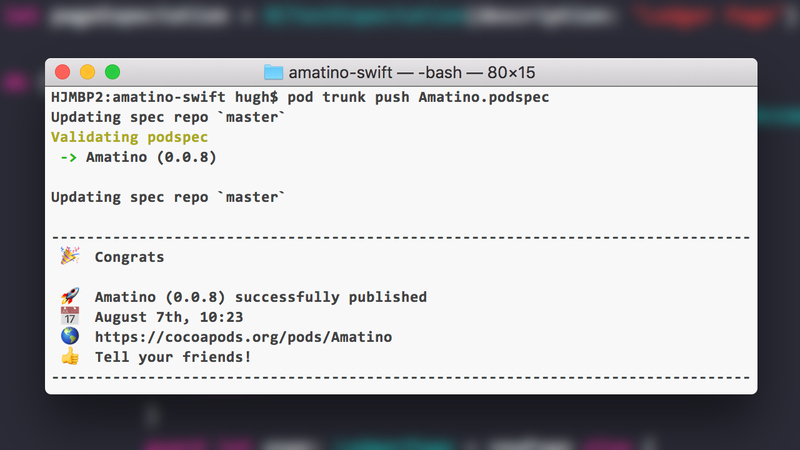 You can install Amatino JS via NPM. For more information about NPM, check out npmjs.com. Take care – This operation may not update the Amatino version number in package.json. You may need to change that manually. 0.0.7 is the first Amatino Python release to include expressive, object-oriented syntax. Previous releases required manual composition of requests using the AmatinoAlpha object. So many new goodies. But how do we use them? 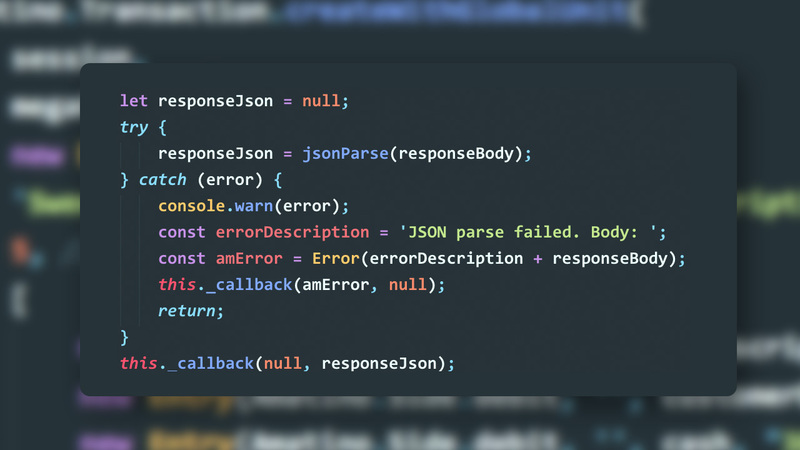 Documentation to the rescue! All the new classes included in 0.0.7 are documented in Amatino Python’s GitHub Wiki. For example, you can check out the Transaction page to see all the Transaction class’s properties and methods. The most glaring omissions are 0.0.7 are probably Balance, Position, and Performance. Expect 0.0.8 to add those bad boys in the near future. 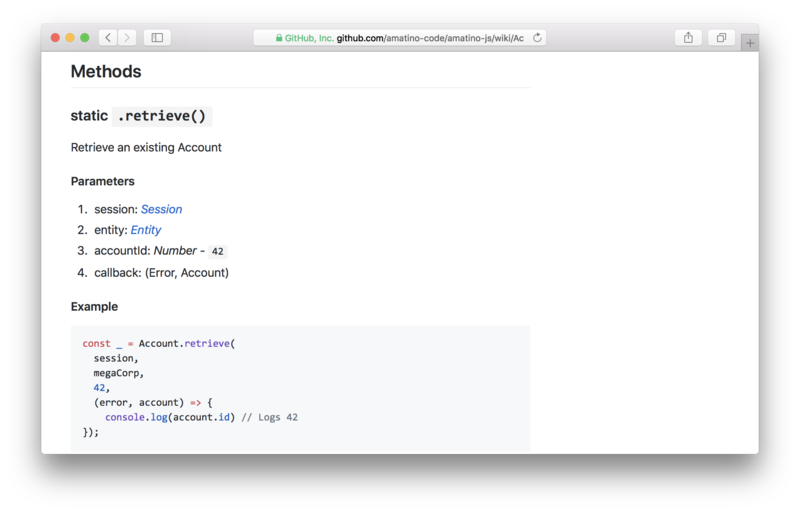 Amatino’s Node.js library has receive a big ‘ol update. 0.0.12 lifts Amatino JS out of bare-bones alpha territory. 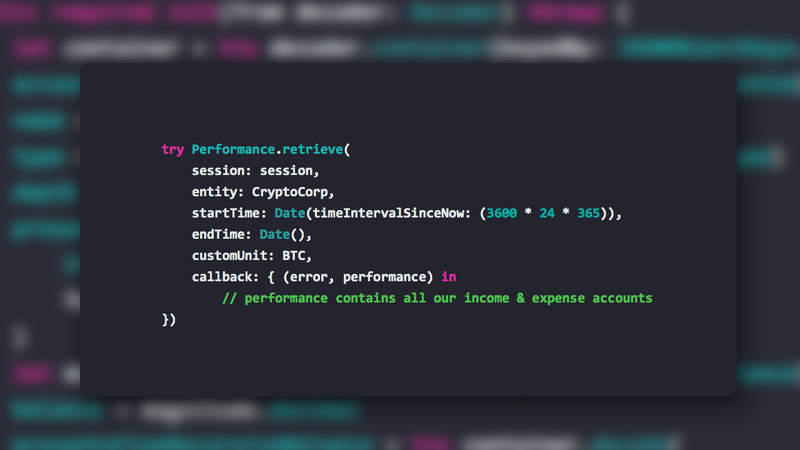 New classes allow you to build accounting & finance functions into Node.js applications. 0.0.12 is by no means a ‘feature complete’ or beta release. Most Amatino services still lack dedicated classes. However, it is a major step towards such a release. To see plans for 0.0.13 and beyond, check out the newly populated GitHub issue tracker, and Projects page within which future work is organised into planned releases. Allowing you to easily access and manipulate the `Primary Objects’ discussed in Amatino’s HTTP documentation. 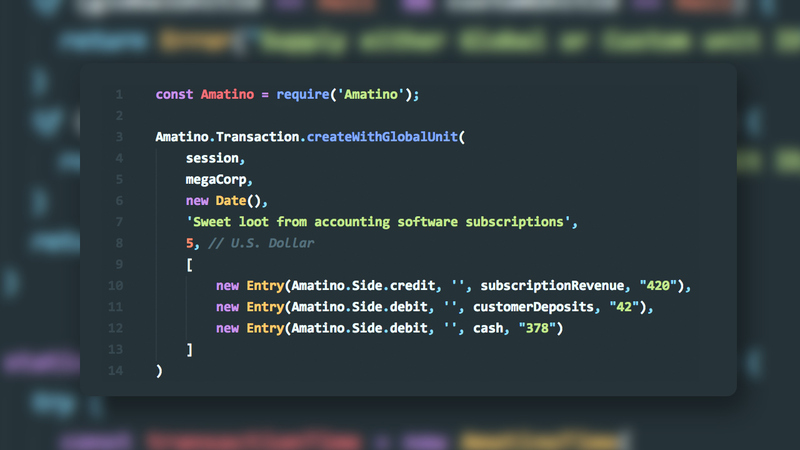 The Amatino JS Readme has been updated with a getting-started guide, including example code showing you how to start utilising Amatino services. Check it out on the Amatino JS GitHub page. Check out the Amatino JS Projects page to see the roadmap for future releases. These plans are totally in flux: Feel free to contact me via Twitter (@hugh_jeremy), email (hugh@amatino.io), or on the Amatino discussion forums, and tell me what you would like to see next. Special thanks must go to James Robb (jamesrobb.co.uk). Over the past few weeks, James has provided substantial and invaluable advice about how to move the Amatino JS project forward. Thank you James! Trees present the entire chart of accounts of an Entity as a hierarchical object. Each node in the Tree summarises an Account, including an individual and recursive balances. Each node is represented by an instance of a class conforming to the Node protocol. Two such classes existing: TreeNode and PlaceholderNode. TreeNodes present summarised account data, including individual and recursive balances. PlaceholderNodes stand in for TreeNodes where the requesting User does not have read permissions for the Account in question. A PlaceholderNode still includes children, which may include TreeNodes if the User has permission to read from accounts further down the hierarchy. Positions are generic representations of the accounting construct variously known as a balance sheet, statement of financial position, or something else depending on your jurisdiction. They include hierarchical representations of all asset, liability, and equity Accounts inside an Entity. Like the Tree, each Account is represented by an instance of an object conforming to the Node protocol. Performances are generic representations of the accounting construct variously known as an income statement, statement of financial performance, or comprehensive income statement, depending on your jurisdiction. 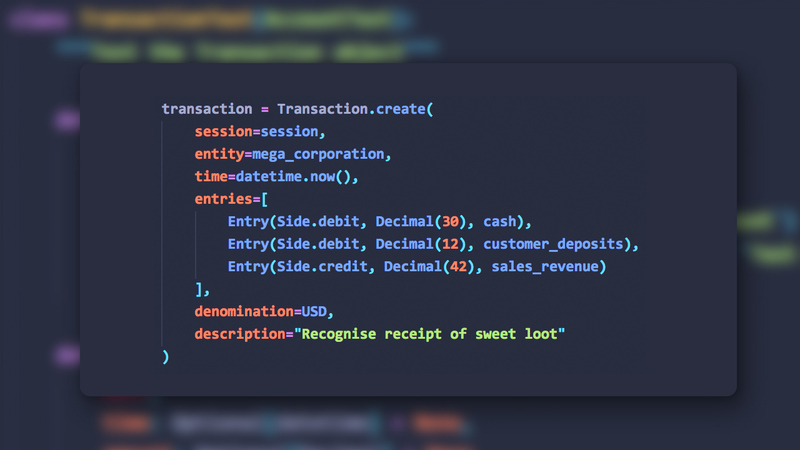 They include hierarchical representations of all income and expense accounts inside an Entity. Like the Tree and Position objects, each Account is represented by an instance of an object conforming to the Node protocol. 0.0.8 will probably focus on units of account, i.e. GlobalUnits & CustomUnits. In particular, loading CustomUnits into an Entity so that you can denominate Transactions in whatever unit suits you.